I have a new paper in press at Scientific Reports (Wilson, Zhu, Barham, Stanistreet & Bingham, 2016; see also the slides from my EWEP14 talk) and I am so excited about it I can hardly cope. This project has been the most pure, good-old-fashioned science fun I've had in years and I'm very proud of the result. 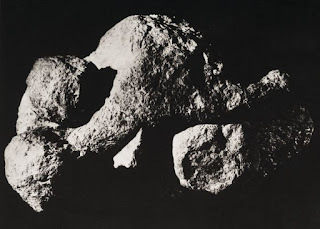 The paper is an affordance analysis of some prehistoric objects (spherical rocks called 'spheroids') that were excavated from a cave in South Africa. There are several theories about what the prehistoric humans used these for, but one is that they were projectiles used for hunting. I created a simulation of projectile motion and set the parameters of the simulation using data from the literature on throwing for maximum distance. We then showed that a majority of our sample spheroids were ideally suited for throwing to inflict useful damage to a medium sized prey animal over fairly long distances. Given that we know humans have been anatomically specialising for throwing for millions of years, and given that we know modern humans can perceive the affordance for throwing to a maximum distance and select objects that best fit this affordance, we argue that these simulations provide evidence that these objects were selected to be used as projectiles. This slightly out-of-left-field project was the result of some good luck, some careful management and the hard work of all my collaborators as we tied this together. The paper stands as an exemplar and proof-of-concept of how a task-dynamical affordance analysis can tell us about the behaviour of prehistoric humans.